No matter where you look in the fields of astronomy and planetary science, humankind’s exploration of our Solar System’s largest planet has been a centrepiece for new discoveries and new insights into our place in the universe. What shaped the architecture of our Solar System, allowing the formation of rocky terrestrial worlds close to the Sun and cold, giant planets at greater distances? Jupiter. What might control the distribution of planetary debris left over from formation, and the bombardment of Earth by comets and asteroids? Jupiter’s massive gravitational influence. Where might we find the perfect conditions for habitable environments? Jupiter’s icy moons and their hidden, liquid oceans are the ideal place to look. Which planet serves as the archetype for the complex, dynamic atmospheres of giant planets, both in our Solar System and around other stars? You guessed it, Jupiter again. And where might we look for the Solar Systems largest natural particle physics laboratory? That would be Jupiter’s powerful magnetosphere, and the beautiful aurora that it creates. Jupiter, Jupiter, Jupiter. It is little surprise, then, that the exploration of Jupiter is at the top of everyone’s list, from NASA in the USA to ESA in Europe. And excitement for new Jovian discoveries is once again building, with the imminent arrival of NASA’s newest mission to Jupiter: the Juno spacecraft. Early in the morning of Tuesday, July 5th, the Juno spacecraft will fire its main engines to enter orbit around the giant planet after a five-year interplanetary cruise. 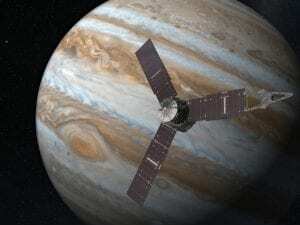 The solar-powered spacecraft carries a suite of new instruments to explore the planet’s interior, atmosphere and magnetosphere, revealing the inner workings of Jupiter like never before. At the same time, Earth and space-based observatories are engaged in an unprecedented international campaign to support Juno’s science. Juno is led by Scott Bolton of the Southwest Research Institute (San Antonio, Texas), and is managed by the Jet Propulsion Laboratory. Lockheed Martin Corporation built the spacecraft. The University of Leicester is home to the UK’s only formal co-investigator of this NASA-led mission, Professor Stan Cowley of the Physics and Astronomy Department, and a team of Leicester’s planetary scientists are engaged in a wide variety of Juno-related science. Leicester’s expertise, honed over decades of involvement with the Cassini mission to Saturn, extends from the churning cloud-decks, through the upper atmosphere and aurora, and into the enormous magnetosphere. 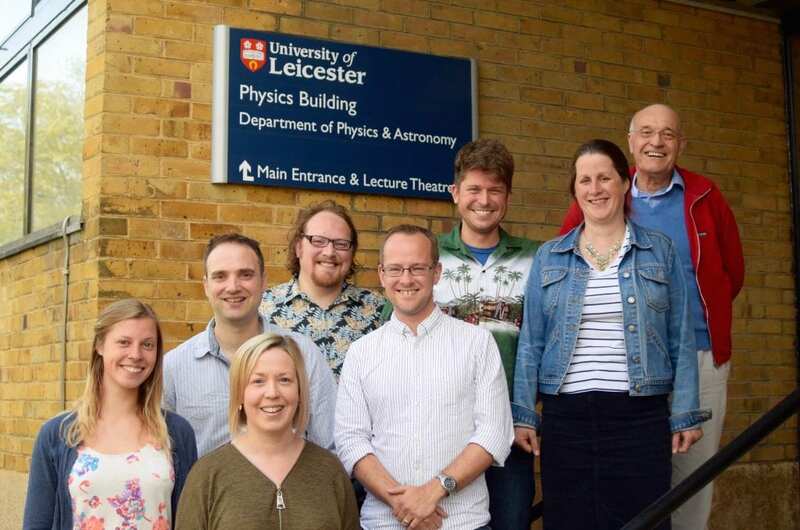 The Leicester team are all members of the Radio and Space Plasma Physics Group (RSPP) in the Department of Physics and Astronomy, shown in the attached photograph. Professor Stan Cowley, Professor Emma Bunce and Dr. Gabrielle Provan use magnetic field data and theoretical modelling to explore the plasma environment of the Jovian magnetosphere and its coupling to the ionosphere. Dr. Jonathan Nichols, Dr. Tom Stallard and Rosie Johnson use Earth- and space-based facilities (including the Hubble Space Telescope) to explore Jupiter’s beautiful auroras and their interaction with the upper atmosphere. Finally, Dr. Leigh Fletcher and Dr. Henrik Melin exploit infrared and ultraviolet observations to explore the variability of Jupiter’s climate, and the origin and formation of the giant planet. We hope that this blog will help tell the story of the Juno mission from Leicester’s perspective, sharing new discoveries and insights as they are revealed. You’ll find articles about specific aspects of our research, the history and challenges of the mission, our use of ground- and space-based observatories to support Juno, and introductions to the Leicester scientists working on this project. We’ll start with an introduction to the spacecraft itself, and what to expect for Juno’s imminent arrival. Thanks for reading!